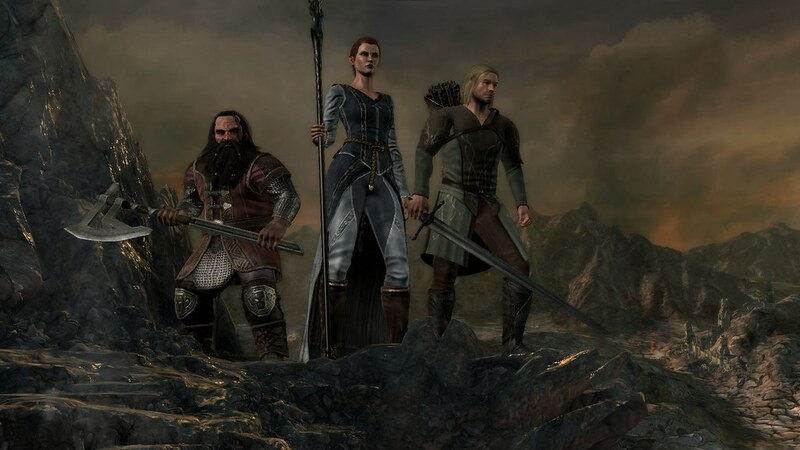 Lord of the Rings: War in the North is a fantasy role-playing video game set in J.R.R. Tolkein's Middle Earth and which very closely follows the art direction in the Peter Jackson (director) Lord of the Rings motion picture trilogy. The game art, especially in the various outfits characters can acquire, is extremely detailed; and the locations frequently feature beautiful vistas stretching to a far horizon. This fantasy art / video game art page for The Lord of the Rings: War in the North has a small selection of Official Wallpapers from the game, available from the Snowblind Studios official website for the game. We have also included below one frame of the looping character selection screen background movie.